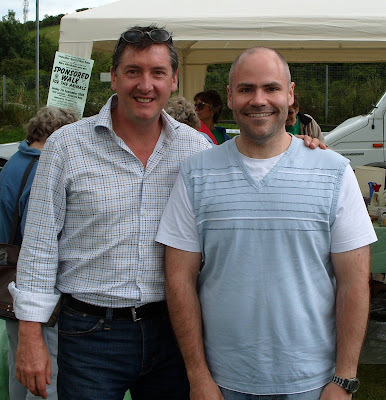 Never mind Simon Cowell, it's me with Robin Cousins! I thought I was skating on thin ice by asking him for a photo, but he didn't seem to mind. I regret not bothering to shave though. As bizarre as it may sound, Robin Cousins wasn't actually an official part of yesterday's RSPCA Open Day - we just happened to see him looking around the stalls. He obviously has a lot of time on his hands since the last series of Dancing on Ice finished. To be honest it was Lisa who recognised him. I just took her word for it and went straight in for a photo. He seemed like a nice guy anyway, and even shook my hand. Mainly because I refused to let him leave until he did. Hang on a moment... that's no decrepit old lady in a blanket... that's Lisa! 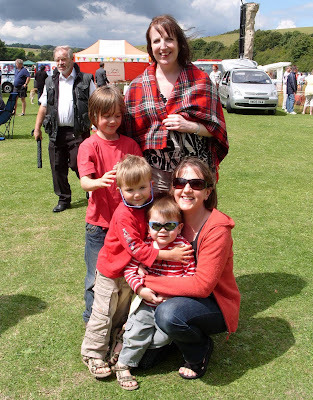 Yes indeed, last year we suffered from sunburn, dehydration and heatstroke; this year it was so cold that Lisa insisted on walking about with my picnic blanket wrapped around her shoulders. She looked like a pensioner with Alzheimers. I only took the thing with us to sit on - I didn't realise she was planning to extend her wardrobe with my lunch accessories. And before you ask, yes, she was wearing it when she took my photo with Robin Cousins. I didn't know where to look. I had to tell him I was her carer. And as for the maternity top she's wearing, that cost me fifty-five quid from Yummy Mummy. It's a shame you can't see it. Anyhoo, I'm sad to report that the organisers didn't heed my advice from last year, and still felt that people would happily enter a raffle to win a bottle of Head & Shoulders. Admittedly I didn't see anyone trying to flog out-of-date TV guides this year, but we didn't get there until lunchtime, so they might have all been sold. But amidst the endless bric-a-crap, I did find one charity worth investing in. I was approached by a cute ten-year-old girl with the gift of the gab and the confidence of a reality TV star, who gave me the hard sell and managed to convince me to hand over a pound to enter her tombola. And who was she raising money for? The National Autistic Society. I thought blimey, if those are the kind of the results they get, I'm buying two raffle tickets.